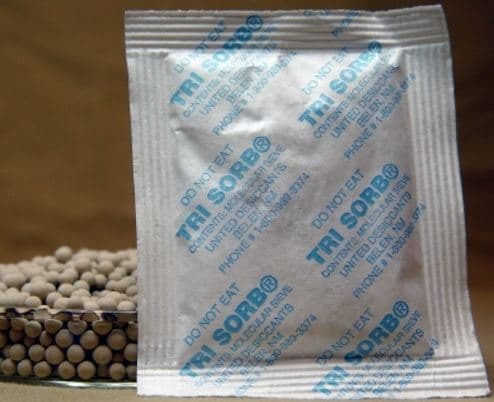 Tri-Sorb® is a prepackaged sachet-style packets of Type 4A Molecular Sieve specifically designed to adsorb water vapor in static environments where tempertures may exceed 100°F and absolute water vapor adsorption is a must. It can achieve extremely low dewpoints in properly sealed packaging in instrumentation. Type 4A Molecular Sieve will adsorb molecules with a critcal diameter of less than four Angstroms. i.e. : Carbon Dioxide. Prepackaged sodium form of Zeolite.